Misty Fjords Air & Outfitting, INC. offers a full menu of Charter options. We have been providing reliable regional air carrier service to our Resource, Business, Government, Tourism, and Community Customers for over 30 years. From Prince Rupert, B.C. Canada, to Sitka, Juneau, Petersburg or Wrangell, we have a long history of safe delivery of air services, expediting, and customer support. For visitors, we would be more than happy to provide you with information on trip requirements, regulations, and solutions for accommodations, restaurants, and stocking up on food and gear before your departure. Timelines, charter or scheduled flight decisions, stopovers, the number of passengers, the amount of luggage or cargo, and aircraft type are all part of the complex logistics that Misty Fjords Air integrates when planning your flight. Our skill at balancing issues that might adversely affect our customers allows us to deliver timely, fair, and consistent service. Total Weight not to exceed 1,200 pounds. Total Weight not to exceed 3,000 pounds. 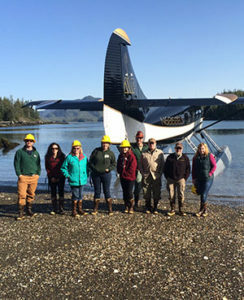 Misty Fjords Air & Outfitting, INC. can fly you, your party and your gear to scores of cabins and shelters that are available for rent throughout Southeast Alaska. Forest Service cabins are usually a Pan abode or A-frame log construction and are well maintained. All cabins have an oil, wood, or fuel stove for heating. Cabins do vary in size but usually hold 4-6 people. All lake cabins are provided with a small boat with oars, and are suitable for a small outboard motor. During the summer months, wildlife encounters are frequent. Your camera will get a workout as Bald Eagles, Black Bear, Sitka Deer, and other animals cross your path. All you have to decide is when you want to go!